The From Spreadsheet block reads data from Microsoft® Excel® (all platforms) or CSV (MicrosoftWindows® platform with Microsoft Office installed only) spreadsheets and outputs the data as a signal. The From Spreadsheet block does not support Microsoft Excel spreadsheet charts. The From Spreadsheet icon displays the spreadsheet file name and sheet name specified in the block File name and Sheet name parameters. The data that the From Spreadsheet block reads from a spreadsheet must be appropriately formatted. The From Spreadsheet block interprets the first row as a signal name. If you do not specify a signal name, the From Spreadsheet block assigns a default one with the format Signal #, where # increments with each additional unnamed signal. The From Spreadsheet block interprets the first column as time. In this column, the time values must monotonically increase. The From Spreadsheet block interprets the remaining columns as signals. This example shows an acceptably formatted Microsoft Excel spreadsheet. The first column is Time and the first row contains signal names. Each worksheet contains a signal group. The From Spreadsheet block interprets the first column as time. In this column, the time values must increase. Each column must have the same number of entries. The From Spreadsheet block interprets each file as one signal group. This example shows an acceptably formatted CSV file. The contents represent one signal group. The From Spreadsheet block incrementally reads data from the spreadsheet during simulation. The Sample time parameter specifies the sample time that the From Spreadsheet block uses to read data from the spreadsheet. For details, see Parameters. The time stamps in the file must be monotonically nondecreasing. For each simulation time hit for which the spreadsheet contains no matching time stamp, Simulink® software interpolates or extrapolates to obtain the needed data using the selected method. For details, see Simulation Time Hits That Have No Corresponding Spreadsheet Time Stamps. Sometimes the spreadsheet includes two or more data values that have the same time stamp. In such cases, the From Spreadsheet block action depends on when the simulation time hit occurs, relative to the duplicate time stamps in the spreadsheet. For example, suppose that the spreadsheet contains this data. Three data values have a time stamp value of 2. The table describes the From Spreadsheet block output. 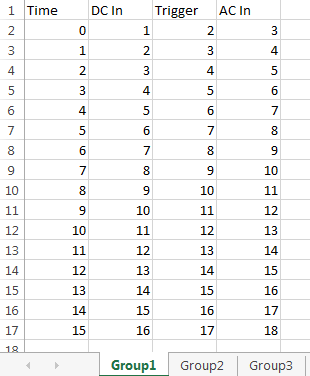 Incremental data from the specified spreadsheet. For each simulation time hit for which the spreadsheet contains no matching time stamp, Simulink software interpolates or extrapolates to obtain the needed data using the selected method. For details, see Simulation Time Hits That Have No Corresponding Spreadsheet Time Stamps. The From Spreadsheet block accepts data type specifications at a block level. If you want to specify different data types for each signal, consider selecting Output Data Type > Inherit: Auto. This option resolves back signal data types using back propagation. For example, assume that there are two signals in the From Spreadsheet block, In1 and In2, which the block sends to ports that have int8 and Boolean data types. With back propagation, the block recasts In1 as int8 and In2 as Boolean. Enter full path and file name of a spreadsheet file. 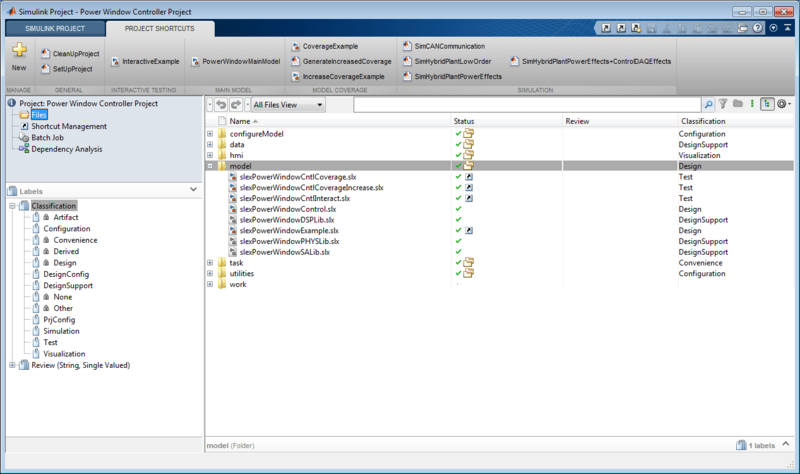 This block supports non-English full paths and file names only on Microsoft platforms. Enter the name of the sheet in the spreadsheet. You can type the sheet name in this edit box or select the sheet name after you open the sheet. If your spreadsheet is the CSV format, the block populates this parameter with the name of the CSV file without the extension. Do not change this value. To open the sheet, click . In the sheet, you can select the range of data by dragging over the desired range of values. Alternatively, you can select the range of data by specifying the range of values in the Range parameter. To specify the range, use the format column:row, with multiple specifications separated by commas. For example, A1:B3,D1:D3,A7:B9,D7:D9. If unspecified, or empty, the block automatically detects the used range, which is all the data in the sheet. If the selections overlap, the block resolves the selection information as appropriate. For example, if you specify multiple ranges that overlap, such as A1:B4,B1:E7, the block resolves the selection to A1 to E7, inclusive. An alternate to using the Range parameter is to open the sheet, by clicking . In the sheet, you can select the range of data by dragging over the desired range of values. The data type for the From Spreadsheet block output. The From Spreadsheet block accepts spreadsheets that contain many data types. However, the block reads the spreadsheet data type as doubles. It then outputs the data type according to the value of Output data type. If you want to specify different data types for each signal, consider selecting Output Data Type > Inherit: auto. This option resolves back signal data types using back propagation. For example, assume that there are two signals in the From Spreadsheet block, In1 and In2, which the block sends to ports that have int8 and Boolean data types. With back propagation, the block recasts In1 as int8 and In2 as boolean. To allow the block to cast the output data type to match that of the receiving block, use Inherit: auto. For more information, see Control Signal Data Types. Time — Treat first column as time. Data — Treat first column as data. The sample period and offset. The default is 0, which specifies a continuous sample time. The spreadsheet is read at the base (fastest) rate of the model. For details, see Specify Sample Time. Extrapolation method that Simulink uses for a simulation time hit that is before the first time stamp in the spreadsheet. Choose one of these extrapolation methods. If the spreadsheet contains only one sample, the From Spreadsheet block outputs the corresponding data value. You cannot use the Linear extrapolation option with enumerated (enum) data. To enable this parameter, set Treat first column as to Time. The interpolation method that Simulink uses for a simulation time hit between two time stamps in the spreadsheet. Choose one of the following interpolation methods. You cannot use the Linear interpolation option with enumerated (enum) data. The extrapolation method that Simulink uses for a simulation time hit that is after the last time stamp in the spreadsheet. Choose one of the following extrapolation methods. Upcasts the data to double. Performs linear extrapolation (as described above for double data). Downcasts the extrapolated value to the original data type. Hold final value — Output the last defined value for the remainder of the simulation. Ground value — Output a ground value depending on the data type value specified in Output data type. To enable this parameter, set Treat first column as to Data. Select to enable zero-crossing detection. The Zero-Crossing Detection parameter applies only if the Sample time parameter is set to 0 (continuous). 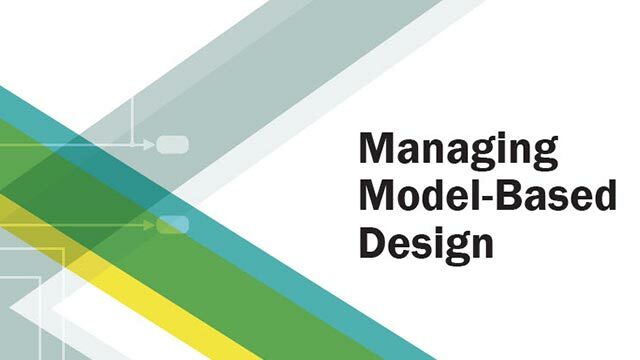 Simulink uses a technique known as zero-crossing detection to locate accurately a discontinuity, without resorting to excessively small time steps. 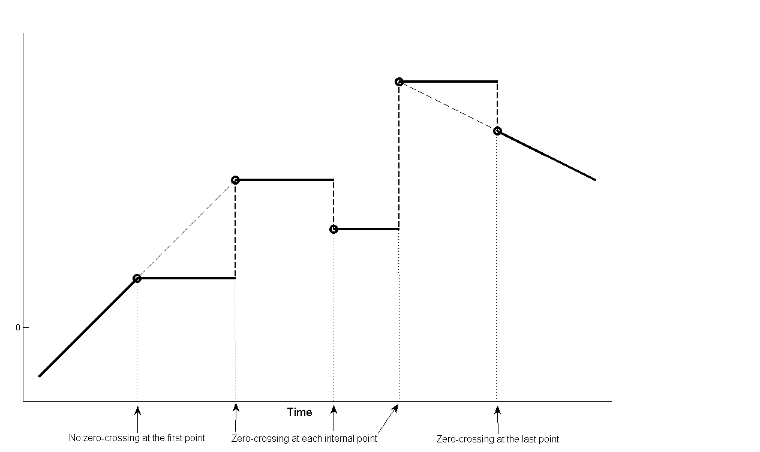 In this context, zero-crossing is used to represent discontinuities. For the From Spreadsheet block, zero-crossing detection can only occur at time stamps in the file. Simulink examines only the time stamps, not the data values. If the input array contains duplicate time stamps (more than one entry with the same time stamp), Simulink detects a zero crossing at that time stamp. For example, suppose that the input array has this data. At time 2, there is a zero crossing from the input signal discontinuity. Data extrapolation before first data point is set to Ground value. 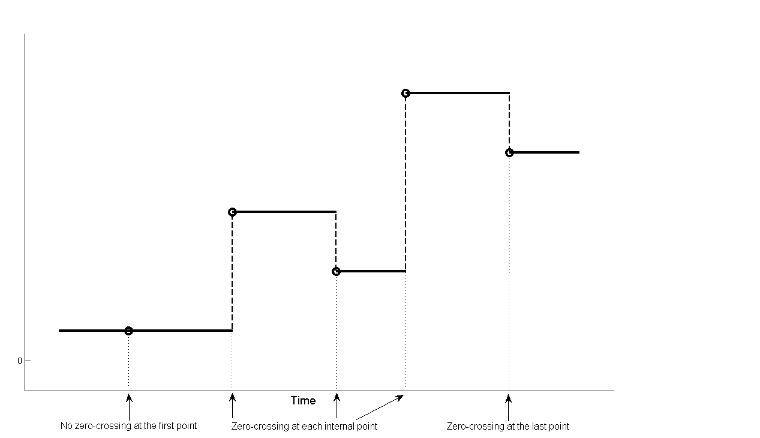 Data interpolation within time range is set to Zero-order hold. Data extrapolation after last data point is set to Ground value. 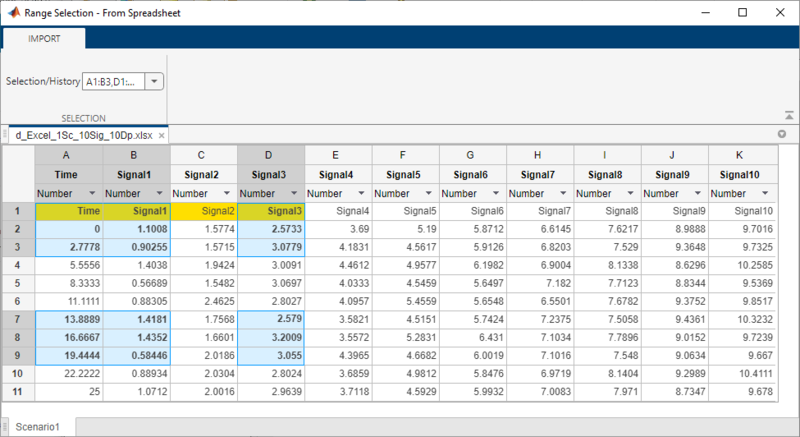 When the From Spreadsheet block reads data from a spreadsheet, it reads all signals with double precision and then casts them to the data type specified in the Output data type parameter for the output signal. During casting, the block uses rounding mode and saturation on integer overflow as follows. The From Spreadsheet block rounds positive and negative numbers toward negative infinity. This mode is equivalent to the MATLAB® floor function. For data type conversion, the From Spreadsheet block deals with saturation overflow by wrapping to the appropriate value that the data type can represent. For example, the number 130 does not fit in a signed 8-bit integer and wraps to –126. Simulating in accelerator, rapid accelerator, model reference accelerator mode, or model reference rapid accelerator mode behaves the same way, and has the same requirements, as simulating in normal mode. The From Spreadsheet block does not support generating code that involves building ERT or GRT targets, or using SIL or PIL simulation modes.